Don Julio Reposado Mexican Rested Tequila is a popular Tequlia available from 31dover.com in 70cl to buy online. 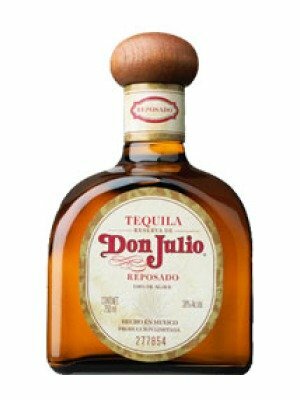 Visit 31dover.com for the best price for 70cl of Don Julio Reposado Mexican Rested Tequila or compare prices on our other Tequlia products. Best enjoyed on its own, or with a refreshing grapefruit soda, or sipped along with fresh Sangrita. Colour: Straw-like colour. Nose: An inviting aroma of mellow, lemon citrus notes and spice layers with touches of ripe stone fruit. Taste: Incredibly soft and elegant hints of dark chocolate, vanilla and light cinnamon balanced with subtle notes of pear, apple and lemon for a lightly honeyed and smooth flavour to be savoured. Finish: Silky, warm finish with an essence of dried fruit and nuts, redolent of a caramel apple. Where to buy Don Julio Reposado Mexican Rested Tequila ? Don Julio Reposado Mexican Rested Tequila Supermarkets & Stockists. You can buy Don Julio Reposado Mexican Rested Tequila online in most retailers and find it in the Tequlia aisle in supermarkets but we found the best deals online for Don Julio Reposado Mexican Rested Tequila in 31dover.com, Amazon.co.uk, DrinkSupermarket.com, TheDrinkShop, and others. Compare the current price of Don Julio Reposado Mexican Rested Tequila in 70cl size in the table of offers below. Simply click on the button to order Don Julio Reposado Mexican Rested Tequila online now.